By Carlos Porter. 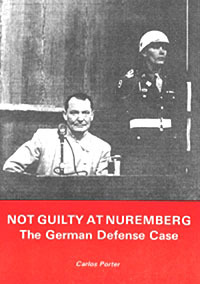 A devastating exposé of the charges against the top Nazi leaders at the Nuremburg Trials, their defence arguments and of how all legal precedents of evidence, procedure and logic were overturned in a revenge-filled rush to find the accused guilty no matter how weak the case. Eye-opening history, based on actual court documents. P/B, 24pp, magazine format.